﻿ In search of the split atom and soaring skylarks! 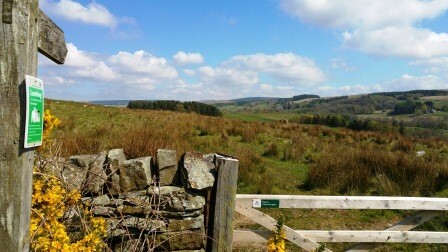 Home > Blog > In search of the split atom and soaring skylarks! In search of the split atom and soaring skylarks! In this busy world we live in, sometimes a little tranquility is required to recharge your batteries. Luckily, Northumberland is full of secluded spots, from windswept moorland to wide-open beaches. 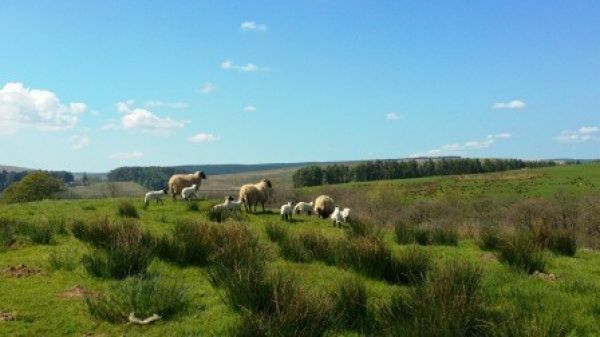 Some of the most tranquil places of all can be found within Northumberland National Park, the UK's least populated National Park. With that in mind, and in need of a little R&R, I decided to take advantage of one of the many walks on offer within the Park. 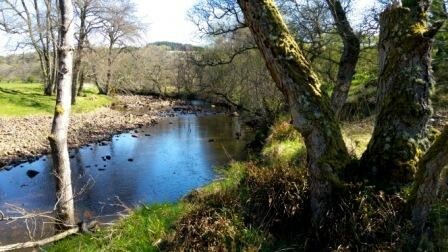 Having previously downloaded the Poems in the Air app on my smartphone, and with a spare OS map (OL42) in my daypack, I started off in search of an elusive poem, residing somewhere along the picturesque Tarset Burn that winds its way slowly through ancient woodlands and flower-rich hay meadows towards the Tyne. Written by Simon Armitage, one of England’s most well known contemporary poets, the poem is one of six commissioned by the National Park. The poems are all locked into the app and the only way you can hear them is to walk out to the places where Simon was inspired to write them. Once you get close, your mobile phone will, as if by magic, come to life as he reads out his poem to you. The app is designed to guide you along a walking route, allowing you to see clearly exactly where you are at any given point (using GPS embedded in your phone). This walk is around 2.5 miles in length and is suitable for families with young children, so long as they have shoes with good tread and waterproofs, should the weather decide to change (it can be a bit squishy underfoot after heavy rain). After a half hour drive from Hexham up the beautiful North Tyne valley, beyond Bellingham, I drove into the pretty village of Greenhaugh and parked up in the lay-by opposite The Holly Bush Inn. Walk out of the village and, in just over a hundred metres or so, you turn down a woodland track to your right (look out for the colourful prayer flags of the Buddhist retreat on your left). After a few minutes, the path opens out along side one of the best preserved flower-rich hay meadows in the National Park, which in late May/June will be buzzing with butterflies and bees, full of colourful wild flowers with evocative names such as yellow-rattle and shepherds smock. Note: Some wonderful time-lapse video of this hay meadow in full bloom can be viewed the the Northumberland National Park website. Just before you reach the ford at the bottom of the hay meadow, you turn left and walk over the small footbridge into the old woodland and along a boardwalk, which weaves its way amongst ancient oaks, dripping with mosses and lichens and reverberating to the repetitive chirps of the Chiff-chaff. Keeping to the path alongside the Tarset burn, you pass through a couple of kissing-gates, into an open meadow, where I was lucky enough to spy a young roe deer bounding lightly towards the copse. Another hundred metres, past the “Fairy Tree”, I found myself on the riverbank overlooking the black pools and bleached stones of a wide section of the burn. All of a sudden, Simon’s words surrounded me, as his poem, unlocked from its casket was set free. The poem is brilliant (I won’t say what is it’s all about, as you will have to find out for yourself, but it does mention the “split atom”). It is certainly worth waiting for as it really captures the magic of the place. A few metres further on, I passed through another gate and turned left across a field full of hyperactive lambs toward Redmire Cottages. Here you step onto a quiet country lane and walk down to the stone road bridge, with fine views across the valley. A few metres further on, the banks were blooming with yellow gorse and the air became perfumed with coconut, which made the whole experience even more summery. The last leg of the walk is back towards Greenhaugh, across open pasture. Aim for the block of conifer woodland ahead where you will turn right towards Boughthill Farm. This section provides long views up and down the valley. All could hear, apart from the lambs’ bleatings, was the swirling shrill of skylarks ascending – perfect! Following the track down through Boughthill Farm, I found myself back at the ford on the Tarset Burn and the hay meadows rising up to the village beyond. Just as I thought it was all over, I came upon a red squirrel feeder attached to a tree in the woods, and one very greedy red squirrel, who was more preoccupied with his hoard of nuts than with me so I was able to take a couple of quick snaps of him with my smartphone, just meters away. Eventually he decided to leap into a nearby tree and was off like a rocket! In just over an hour, I had seen and heard so much, but felt completely relaxed and recharged. 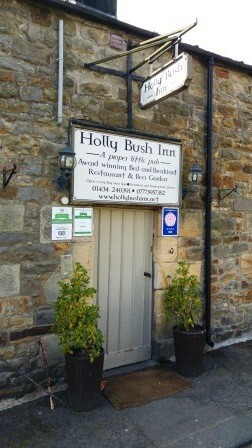 Even better, The Holly Bush Inn was waiting to provide me with food and liquid refreshment – what more could I ask for?